When pigs fly? You’ve got yourself a deal! I’m a sucker for a good mechanical puzzle. Figuring out which piece goes where to complete a given item or accomplish a certain task is a staple of many roleplaying games and video games, and coincidentally, that’s one of my favorite aspects of each. Rube Goldberg machines, perhaps the pinnacle of mechanical puzzle tinkering, never cease to entertain or amaze me, as you can tell by some of the videos Eric and I have posted in this blog over the last few months. Like many of those who enjoy mechanical puzzles, I can trace my interest back to the board game Mouse Trap, which featured an elaborate multi-stage trap to snare your fellow mice. I don’t recall ever actually playing the game as instructed. Instead, friends and I would freely add pieces, complications, rules, and new wrinkles to the mouse trap itself before setting off the trap with glee. I have plenty of fond memories solving (and designing) mechanical puzzles of all sorts. Unfortunately, I’ve been having a difficult time sparking the same interest in my nieces and nephews. Sure, I’ve gotten them all hooked on LEGOs, which is a marvelous start for the tinkerer spirit, but more often than not, the kids would build the sets precisely as instructed, and then just leave them that way. No disassembly, no experimentation to build their own sets and ideas. None of them have a bucket of random LEGO pieces made up from the fragments of a dozen or so disassembled sets, or know the joy of digging through the bucket laboriously in order to find the one perfect piece to finish a creation of their own design. Thankfully, my cousin delivered the ideal solution as a gift for Nephew #3’s birthday, discovered by chance at Wal*Mart. The Smart Lab Weird & Wacky Contraption Kit. This thing is great. The goal is to build a path from the top of a velcro-friendly wall to the bottom for a marble to traverse, traveling down slides and through obstacles of all sorts, in order to reach the landing pad at the bottom, which launches a spring-loaded celebratory pig into the air! 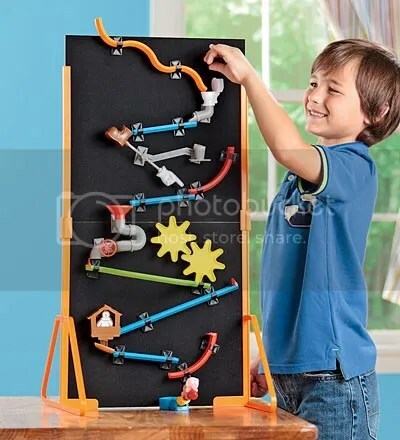 It’s similar to plenty of pipe-and-marble toys from years past, but with a lot more adaptability and flair, and it was an instant hit. Not only did every niece and nephew want a turn designing their own contraption, but they freely made suggestions (helpful and otherwise) for each other’s designs. The best thing about it? When designs failed or the marble stalled, the kids didn’t get disheartened. It just encouraged them to try again and indulge their cleverness even further. It was a blast simply to watch. And you better believe the adults got into it too, adding new wrinkles and complications to each contraption, and cheering just as loud when the pig was launched into the air after a successful run. My cousin was roundly praised as king of the gift-givers that day, and I’ve been recommending the toy far and wide ever since. It’s a great mechanical puzzle and a fun time all at once. And it’s got a flying pig! What more could you want? This entry was posted in Games, Kids, Puzzles and tagged DIY puzzling, games, Geeking Out, National Treasure, Puzzlin' fool, Rube Goldberg, Smart Lab, The Goonies, Toy by gmdirect. Bookmark the permalink.